I've been mixing up my skincare routine for the Summer. My skin is a little more oily and I like to modify it according to the season. I've been incorporating some new products from Pixi. Check it out! 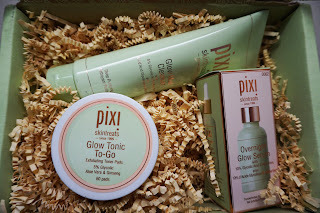 Pixi has really surprised me with their quality skincare products. I love that they're so accessible too! Anytime I need a refill, I'll just run to target. First up, their Glow Mud Cleanser is an awesome face wash. It's a thick, gray consistency that I lather up with water in my hands and then apply to my face. I love any mud type skincare products. I definitely feel like it deep cleans my pores but is gentle at the same time. It also contains glycolic acid and aloe, bonus! After cleansing I tone with the Glow Tonic to go. I feel like I'm really getting off any dirt I missed and rebalancing my PH at the same time. I'm never good with adding a toner into my skincare routine, but these little pads make it so easy. Lastly I use the Pixi Glow Serum to really pump up the moisture. The consistency has a bit of slip to it but feels really lightweight. Serums are a must have in my routine. The only thing is that my dropper came a little crooked so it's hard to get the product out, so I used another spare dropper instead. 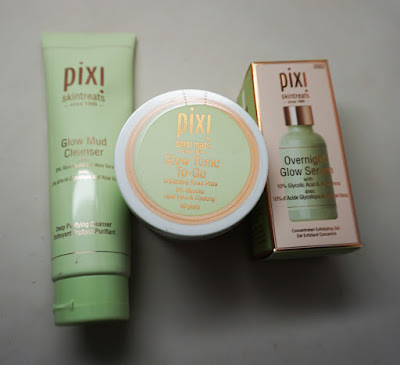 All of these products are high quality and pretty affordable and available at Target, PixiBeauty.com and anywhere that sales Pixi Products.